Under clouds last Saturday, after a week of mostly rain, we happily transplanted broccoli, kale, brussel sprouts, cauliflower, more tomatoes, basil and dill into the garden. It was a great day for transplanting – cool and wet. 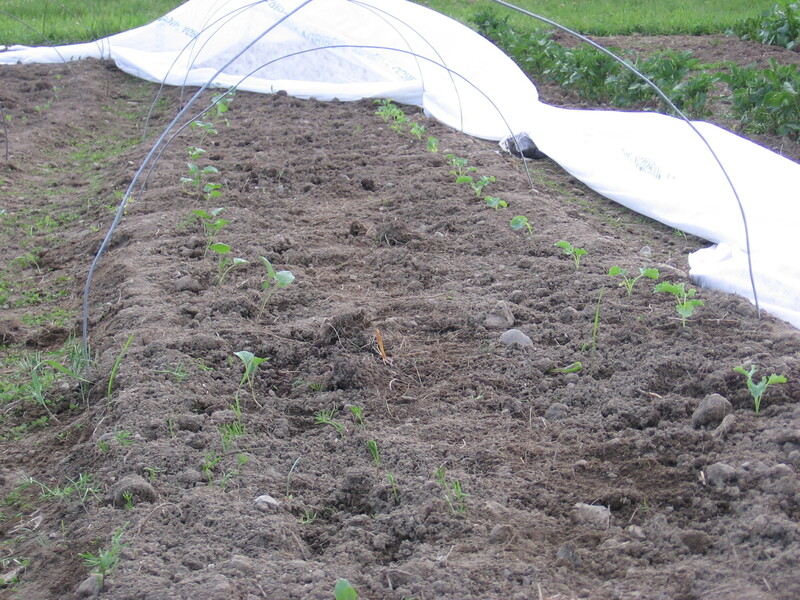 We planted two beds halfway with the brassicas (broccoli, kale, brussel sprouts, cauliflower) and covered them with remay to keep the flea beetles out. 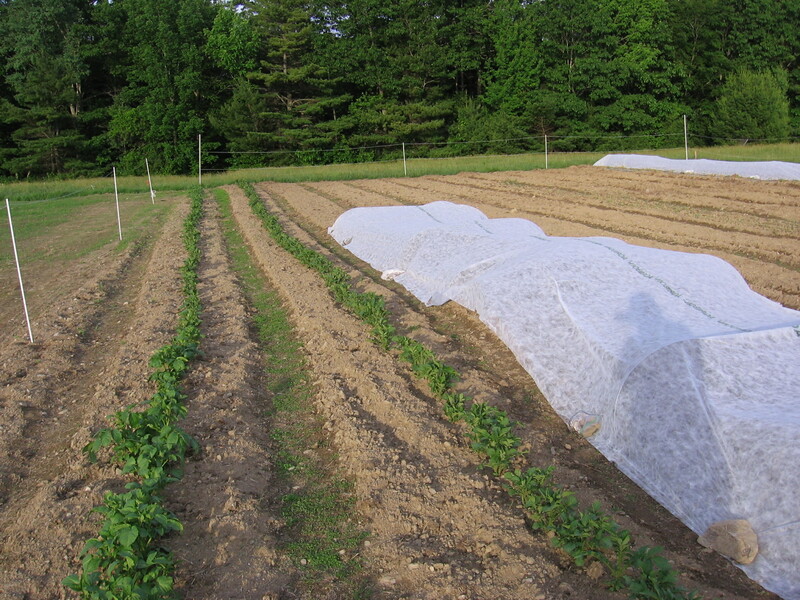 In the other half of those beds, we planted corn (8 rows in 4 beds all together). By yesterday, much of the corn had germinated. We have 102 tomato seedlings in the ground now (and more in pots getting ready to be transplanted). If it’s a good year for tomatoes, we might just be overrun. But we do enjoy canning tomato sauce and salsa, and last summer we roasted and froze tomatoes, which were great for soups. The potato plants are huge, and we’ll have to hill them soon. Our clover is growing well between the garden beds. We’re hoping the clover will keep the weeds down and add nitrogen to the soil. The potatoes are bigger every day! 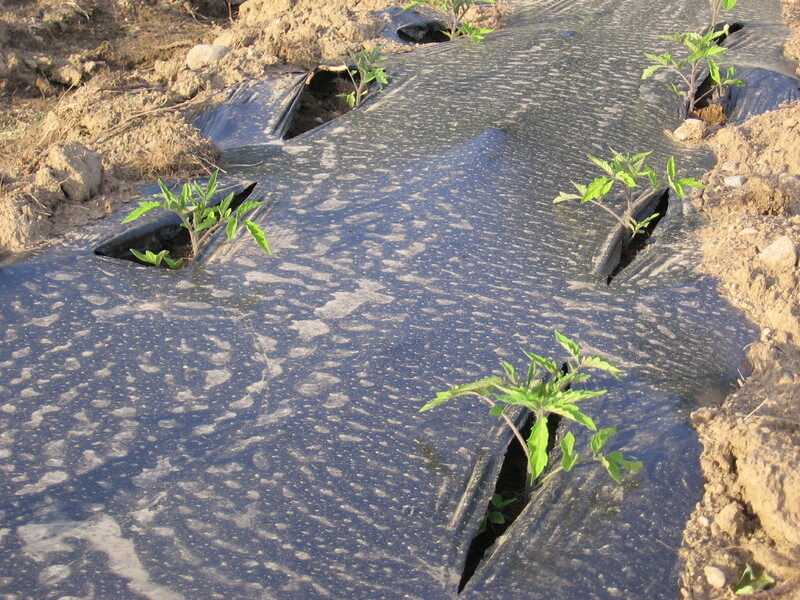 We’ve planted two kinds of melons inside in trays – a cantaloupe and a yellow watermelon. I can just imagine the juicy sweetness, and I can’t wait. The melon seedlings are leggy, but they’re growing. We’ll put them in the ground in a couple of weeks. Our pumpkins and squash plants are doing well. We planted the seeds directly into the garden on May 22. 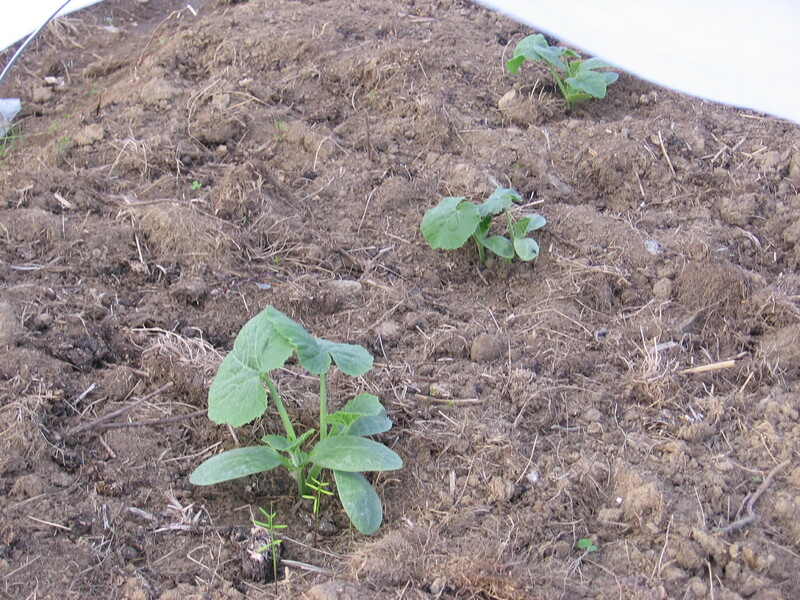 Cucumber seedlings we transplanted on May 30 are also growing well. And we bought a truck! We found a 1994 Chevy Silverado 4×4 with a rebuilt engine in pretty good condition for $3,000. 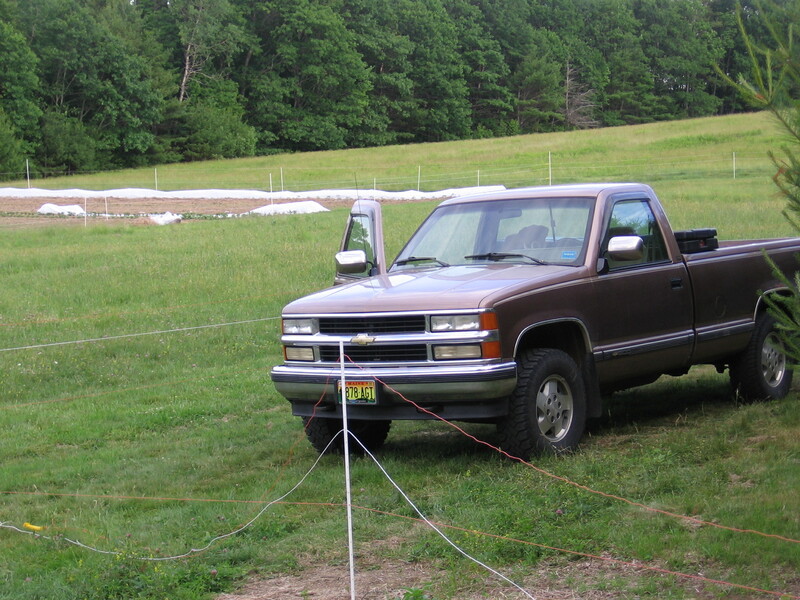 Now we can haul all the manure, veggies, chickens, wood and compost we want, without making many trips with our cars. There’s so much hope and expectation this time of year. We watch the garden fill with lush green and wait with hopes of few pests and good weather. This entry was posted in The garden and tagged broccoli, corn, cucumber, farm, garden, gardening, kale, pumpkin, remay, seedlings, tomatoes. Bookmark the permalink. And I didn’t know you had a new truck! You’re real farmers now! !